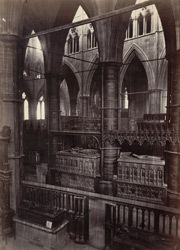 "Within the old oak screen to the left is the altar tomb to the Earl of Pembroke, half-brother to Henry the Third. On the right is the altar tomb of alabaster to John of Eltham. The magnificent altar tombs immediately opposite the screen stand in the Confessor's Chapel - that to the right is to Richard the Second, died 1399-1400, and his Queen Anne, died 1394; the other is to Edward the Third, died 1377. We have also a pretty peep of the old screen and coronation chair at the back of the new Reredos. The general view from this Chapel is singularly fine."